In my review of American Horror Story’s season premiere—and AHS: Roanoke’s first episode—I hoped that its reconstructed-mystery format would offer opportunities for contradictory memories, unreliable narrators, and evocative gaps in a shared story. But in the excitement of a new seasonal arc, I forgot one thing: Enjoying unreliable narration means trusting that the story-building process is reliable. And reliability isn’t American Horror Story’s strong suit. As Matt says to the camera, “It’s amazing how long a person can rationalize the irrational.” Maybe my enthusiasm was irrational, but I entered “Chapter 2” eager to see how the framing conceit established in “Chapter 1” holds up. How it holds up is… poorly. Let’s start with what works. Michael Goi has directed previous AHS episodes, including one of my favorites, and “Chapter 2” displays the command of space and small gestures that made “Flicker” work so well. Shelby and Matt peering down to the dark root cellar, the aerial shot sweeping up to a yellow hoodie hung high in a tree, knives jutting unexplained from the ceiling—the episode is full of strong images and unspoken actions. Just watching Lee, Matt, and Shelby maneuver around the kitchen, their hands making fleeting contact as the trio they’ll never truly form splits into one duo-and-bystander, then another, is a quiet lesson on letting space and blocking define relationships. Unfortunately, unlike “Flicker,” “Chapter 2” doesn’t trust silence. The gestures and glances and would-be quiet moments are drowning in talk. As the bloodthirsty sisters grin and snicker their way through murder after murder, Cunningham describes their scheme; as Lee’s little daughter Flora (Saniyya Sidney) wanders the empty halls of the house, Lee’s voiceover laments her guilt at bringing her daughter there. It’s the nature of the format, matching talking-head segments to reenactments, but it weighs down the action and the tension alike. It’s moderately creepy to watch (reconstructed, fictional, mediated) Shelby and Matt peer down a dark set of unknown stairs, even if we wonder why they never noticed the big hatch to the root cellar just a short walk from their front door, especially while poring over the property trying to figure out how their assailants keep disappearing. It’s moderately compelling to watch them watch the video left by Elias Cunningham (Denis O’Hare), professor and true-crime author, who was so terrified by the house that he camped out in the cellar. It’s moderately unsettling to hear the horrors Cunningham has to tell: of the sisters and nurses who once owned this vast house, who used their assisted living facility to lure the most vulnerable victims, of the family before them who vanished, of the older, eerier forces that may have done away with them all. These developments are moderately compelling and moderately creepy, instead of just dumb, precisely because they’re so clearly mediated, fictionalized, and reconstructed. The structure provides distance. Even as the gruesome acts play out, we know this isn’t just fiction; it’s a lurid reconstruction within a fiction. It’s okay if it’s dumb. It’s been dumbed down—we can assure ourselves—not for us, but for the fictional audience who would watch this story uncritically. The story of the nurses is ghastly, but the reconstruction (really a reconstruction within a reconstruction) is preposterous. Miranda (or is that Bridget? The credits make it clear, but AHS hasn’t bothered to distinguish them on-screen) takes a cartoonish, salacious relish in dispatching her helpless prey. That’s not a measured, thoughtful distance creating room for clever narrative deceptions. 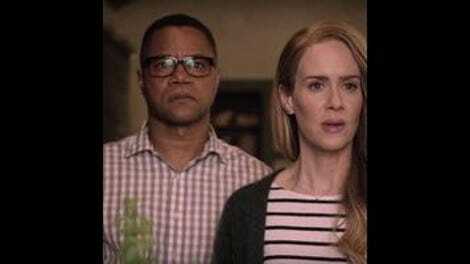 It’s the same old ironic distance American Horror Story has wallowed in for years, that lets it glory in violence without giving it emotional weight. We don’t know who Margaret is, or who Una is, or who Roger is. We just know that their names, and two others, add up to the bright red MURDE the sisters paint on the wall. Denis O’Hare manages to make Prof. Cunningham both wildly untrustworthy and weirdly credible. His darting eyes, his cracking voice, his frantic ranting all add up to a broken man. But he’s not too broken to face the thing he fears most, somewhere in that house—and not too broken to document right up to the last seconds. “I am not what I am,” he mutters as the tape begins, before explaining how he ended up on the property and what terrible errand he’s setting himself. Ending with his last terrified excursion into the abandoned house, Cunningham’s video is a nod to The Blair Witch Project, complete with a sequence shot straight up his nostrils. But when the real Shelby (“real” is relative here) confirms to the camera, “It seemed totally crazy, but everything he said on that tape was true. The letters on the wall proved it,” it’s impossible to be sure AHS is in on the joke. The letters Matt finds under the wallpaper don’t prove anything, except that someone, sometime, painted MURDE on the wall of the house. The splashy, Mansonesque MURDE isn’t the only clunker in this episode. In a traditional ghost story or horror series, a man walking through his house to find a nurse and an elderly patient inexplicably going about their routine would be a shocking swerve. In a carefully constructed story, Shelby’s abrupt changes of attitude—from desperate desire to flee to determination to stay put and back again—would surely hint at some hidden agenda or unexamined impetus. But on AHS, shocking swerves and inconsistent motivations are business as usual. There’s no reason to trust that they’ll pay off in a coherent ongoing story or character development. There’s no reason to trust that they’ll pay off at all. Even so, it could be fun to revisit these old tropes if they’re played cleverly, and if you can trust the creators to play fair. But they aren’t and you can’t. So it’s tedious to watch Cuba Gooding, Jr., muddle through a spectral phone call, waiting for him to learn that—gasp!—the landline was never plugged in! It’s tedious to watch the cop search the house for the nurse and the corpse she left behind, waiting for him to find—gasp!—nothing! (Hey, why didn’t they turn on the lights instead of searching by flashlight? The 1980s-vintage fluorescent vanished with Miranda, Bridget, and Margaret, but they didn’t abscond with the Millers’ sconces, too.) It’s tedious to see Angela Bassett flinch from a collection of pig’s tails that squiggle comically where they’re nailed into the wall, then look again to see—gasp!—nothing! If the writers want the audience to believe the show’s clumsiness is intentional, not accidental, if it wants us to follow its sudden swerves and diversions, if it wants us to extend the credit of believing the show and its writers are in on the joke, it needs to be more credible to begin with. If it wants us to parse all the inconsistencies and contradictions its current layers of character and narrative are spewing (and that’s a big if), it should have displayed consistency of character and narrative in the past. Lack of pay-off has always been American Horror Story’s biggest problem. That might sound harsh for a new season, a brand-new story just begun. But along with its history of tour de force performances and bold visuals, the series has a history of false starts, dead ends, and dawdling diversions. What it doesn’t have is a history of cleverly nested narratives, or of thoughtful ambiguity, or of measured meditations on the nature of storytelling. That’s the fundamental mistake I made last week: I gave American Horror Story: Roanoke more credit than it deserves. AHS has always been exactly what it wants to be, and it’s unlikely the show will surprise us in its sixth season with pensive self-reflection. Instead, it’s giving us the same old load of MURDE. Also like “Flicker,” “Chapter 2” is satisfyingly short. It’s a pleasant surprise when an AHS episode doesn’t exceed its hour. After the short shrift Angela Bassett got last season, it’s rewarding to see her portrayal of Lee get fleshed out a little with the introduction of her daughter, and the corresponding flashes of gentleness, softness, and despair. It makes no sense that after someone left a video playing in her basement, Shelby was dead-set to abandon her house as haunted, but after happening upon strangely costumed mob sacrificing a man over a fire, she decides it it was a hoax by their real-estate auction rivals. Any haunted-house tale has to justify the residents staying put, but Shelby’s motivation and credulity are more than mercurial or clouded; they’re incomprehensible.